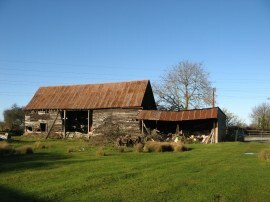 I did this walk on Monday 2nd January 2012. 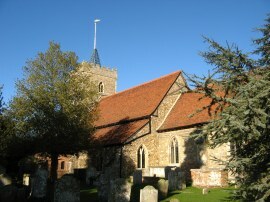 I parked by the small church in Mundon which is on the route of the walk and was where I had finished the previous stage. From there I followed Vicarage Lane, photo 1, round a couple of bends before taking a broad path running between fields down the village of Mundon, photo 2. Here the route heads to the right, passing past the pub before joining another farm track, immediately after the last house on the left. This is followed up to the buildings of Sparrow Wycke Farm, the route heading past the farmhouse and then turning briefly right, then left, to head out into a field. 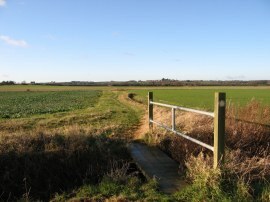 The route then meanders along the edge of a couple of fields, crossing a small wooden footbridge, photo 3 as it makes its way over open countryside towards the village of Purleigh. It was a lovely bright sunny day with excellent visibility although with a fairly strong, and quite cold, wind blowing from the west. 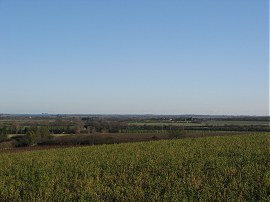 As I headed over the fields I could see the village of Purleigh growing ever larger on the hill ahead and in the distance away to my right Maldon. 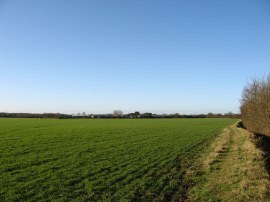 This stretch of path across the fields is followed down to the very busy B1010 Fambridge Road where the route heads to the left for a short distance before joining a footpath running along a field edge on the opposite side of the road, the path continuing its progress towards Purliegh which was growing steadily nearer on the hill ahead. 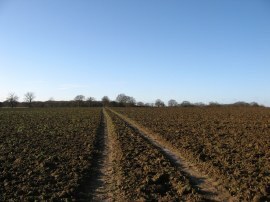 The path heads across the fields towards a house where the route turns briefly to the left before joining a minor road, Simmonds Lane. Here the St Peters Way heads off to the left, the low sunlight shining through the trees lining the road. 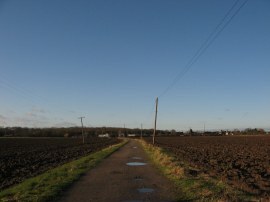 The road is followed for a short distance until just before the first house on the right where the route joins a footpath on the right which heads diagonally across a field, and then bears left over the middle of the next field. 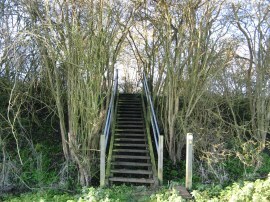 Reaching the end of this field the route heads up and down a couple of flights of wooden steps, photo 4, that leads over an old railway embankment along the line which used to run to Maldon from Woodham Ferrers and closed in 1953. The path then continues ahead on what was a very muddy and sticky section of path running across the middle of a field. Eventually the route left the muddy field, crossing over a small footbridge by a pond and beginning to head gently uphill across a couple of small paddocks. 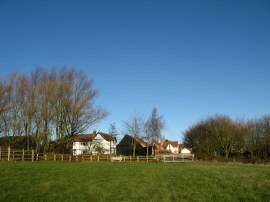 The path then heads to the right towards some houses on the outskirts of Purleigh, photo 5. Leaving the fields, the route then heads along a short stretch of road before bearing to the left through the Churchyard of All Saints Church in Purleigh, photo 6. In the church is the grave of a police sergeant who was murdered in the execution of his duty back in 1893. The following link Essex Police Memorial has full details of what is an interesting story. Passing through the churchyard the route then heads to the left along Church Hill for about 50 yards before joining a footpath on the right, heading through a kissing gate and out into a field, the route bearing to the left along the field edge. Ahead there were good views across to the town of Maldon and away to the right far reaching views down the Blackwater Estuary towards the Bradwell Nuclear Power Station and much of the countryside I had been walking over since the start of the path, photo 7, the water tower near St Lawrence also just visible on the horizon. Leaving the field the route heads downhill and across the B1010 Barons Lane before bearing to the left and along the corner of a vineyard, photo 8. 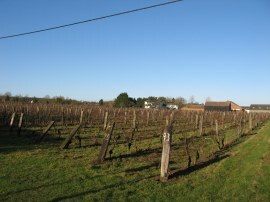 The route follows the footpath round the edge of the vineyard around to the right before heading to the left to cross back over the road and join another footpath that heads up along a hedge lined track that leads out to an open area of rough ground. Leaving this area the route heads diagonally to the left towards the far corner a small paddock, which was very muddy and waterlogged, before turning to the right along a tree lined public byway. 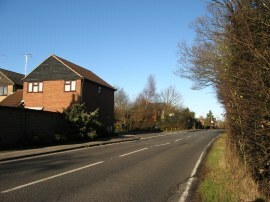 The byway is followed downhill and past a couple of houses before heading to the left along Lodge Lane. On the lane I passed a woman out walking five small dogs, all on separate leads; I remarked it was a wonder they didn't tangle themselves up in knots but apparently the dogs were very good. Reaching the end of Lodge Lane the route heads briefly to the right along Birchwood Road before joining another footpath on the left running down the edge of a large open field with a house to the right. 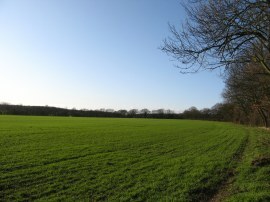 The route then follows the field edge round to the right, photo 9, before joining a footpath that bears to right, diagonally across the field towards a section of hedge jutting out into the field on the opposite side. The path then follows the hedge as it makes its way along the field edge down to Hackmans Lane where the route heads to the right. 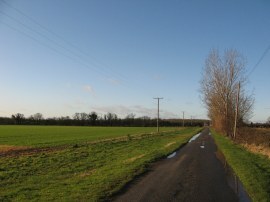 The route then follows this road for about a third of a mile until, just before the Corporation Bridge is reached and the road bends to the right, the St Peters Way joins a footpath on the left that heads out across another very large open field, also signposted for one of the Essex Wildside Walks. Having crossed the section of open field the route then heads along the left hand side of a hedge curving gradually around to the left alongside a long, open field, photo 10. Today's stretch of the St Peters Way follows a fairly straight course across the Essex countryside and for almost the entire distance I was walking directly into the strong wind which got a bit tiresome, particualrly in the more open exposed places. Reaching the end of this field the route passes a small pond and heads across a paddock before turning to the right down towards the buildings of Wickham's Farm. I think I went slightly off course here as I went to the right of the first couple of barns, photo 11, but I think the path actually runs along the field edge to the left of them although I wasn't exactly sure how the path enters into this field. Anyway, heading through the farmyard I then turned to the left on a path that heads along a hedge and out across the middle of another field of winter wheat. Luckily with all these crossings over the middle of fields the ground was dry enough to prevent the soil sticking to my boots in any great quantities and there was only a couple of occasions when I had to give my boots a quick clean with a stick, unlike the mud I had encountered at the end of the previous stage. Reaching the end of this field the route heads to the right along the field edge for a few yards before turning to the left across the middle of another large open ploughed field, photo 12. Here I spotted some deer footprints although I never saw any of the deer themselves. 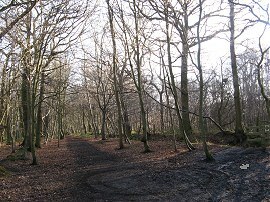 The path heads over these fields towards Folks Wood and reaching the trees bears to the right around the edge of the woodland. The route then continues on ahead to reach Thrift Wood, photo 13, where the route heads briefly to the right along a broad path then left at a crossing track before bearing almost immediately right once again down to the Main Road in Bicknacre, photo 14. Reaching the road at Bicknacre, which is where I finished this stage of my walk along the St Peters Way, I had walked another 7.5 miles along the path. 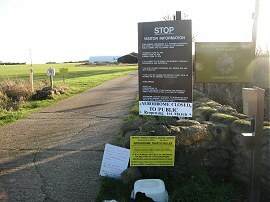 As usual I have uploaded the route of the walk which can be accessed here: St Peters Way Stage 3 Route. I then turned to the left along the road before joining a path that lead back into Thrift Wood as I started making my way back to the car in Mundon. Shortly after entering Thrift Wood a very mean spirited Jack Russell type dog walked past me and then turned round and bit me on my right calf which was very painful for a little while and for a few days I had the imprint of the dogs jaw line on my leg as well as a lumpy bruise. Luckily the bite did not really break the skin much although the mark was still visible nine days later. The rest of my journey back was relatively uneventful and I was able to head along a circular route that avoided most of the paths I had walked on the way out. These included a stretch of footpath running past Stow Maries aerodrome, photo 15, which was not a place I was aware of previously. Back at the car I had walked a total distance of 15.8 miles for the day.